Presair’s air switching technology uses a pulse of air to switch electricity on and off, safely isolating the user from the electrical current. Safe, versatile and easy to use, Presair’s electric to pneumatic converter box works with many different appliances, such as TVs, lights, computers, stereos, garbage disposers, drill presses, and scroll saws. 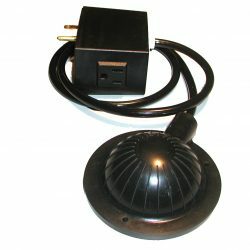 The air switch box instantly converts any standard 120 volt grounded outlet to a switchable connection. Simply attach the air tubing, plug the electric to pneumatic converter box into the outlet, plug your appliance in and Presair’s air switching technology is ready to perform on/off control of your appliance. Choose your desired air switch function below and tubing lengths to fit your application. For more information on Presair’s air switching technology click here, or contact us.